Over the weekend in professional land (NFL), they held the draft and Matthew Stafford gained the honor of being the number one pick for the Detroit Lions. Stafford’s recently former school is the Georgia Bulldogs so this episode of Mascot Monday will take a peek at the dynamic duo of Hairy Dawg and Uga. Uga has a rich history and following. 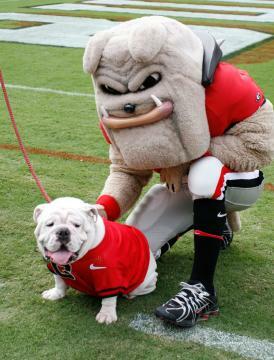 Hairy Dawg is relatively new compared to Uga, but he’s just now turning the corner of mascot-dom. Whether these two will be the number one pick in a mascot draft, we’re unsure of. But word from Kiper tells us they could go top ten.